It’s been a while since last posting. What is new? (Hint – this post is going to relate to family and the recent death of Daniel Berrigan.) Some things are ongoing – I could describe the usual actions with Brandywine Peace Community, including civil disobedience at Lockheed Martin and arrest this Good Friday, 2016. I look at these recurring actions as a matter of faithfulness. I could speak about community building (building local community and removing support from our war-making government is the future that I foresee). I could focus on the environment, and also say something of our chickens and bees, and our attempt at (relatively) simple living. Or actions at Villanova, including speaking out at the West Point/Villanova Ethics of War Conference (asking VU President Father Peter what Jesus would think about “just war”). Or even just tell of our customary camping and backpacking trips. 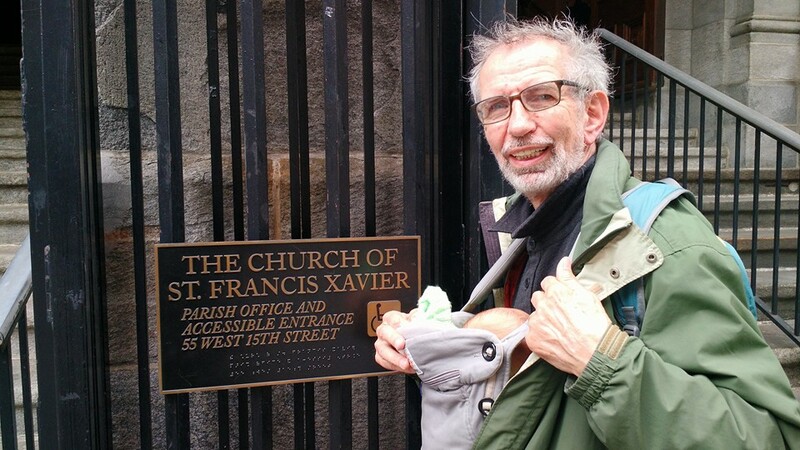 But the big news is that I have my first grandchild and have just returned from a stint of Jasper baby care in Brooklyn. One day we went to the Brooklyn Botanical Gardens (of course). Not so “of course” – I took Jasper on the subway to Manhattan so that he and I could attend Daniel Berrigan’s wake. Two months old, and I touched his foot to Dan’s casket. Jasper won’t remember, but it is something his family will remember and that he will hear about and struggle to understand, and I hope that eventually he will understand why this was such a very important event.